FEB. 20, 2018 – SOUTH NORFOLK, VA — Norfolk Southern Corporation is working on the railroad with this interesting railroad maintenance vehicle. There is a cab for the driver and an articulating arm for grabbing and moving railroad ties. The “tie-grabber” can pull the ties out from beneath the tracks, and it can push the new ones back into place. Here, it’s stacking old ties away from the tracks. The process is interesting to watch, so take the time if you can and observe the show. 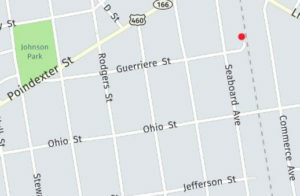 The South Norfolk train station was just off Seaboard Avenue at the end of Guerriere Street marked on the map with a red dot. The train would stop in South Norfolk for freight and passengers. Much of the freight originated at the knitting mills down by the river and was transported to the railway depot by horse-drawn carriage. The trains don’t stop in South Norfolk anymore (well, okay… except for loading and unloading sometimes), but the Amtrak passenger trains continue to pass through daily. Actually, sometimes passenger trains do stop on the tracks, not blocking intersections, early in the mornings before dawn. They may sit for 20-30 minutes or more with their inside lights on so travelers can read. No one disembarks. The tracks have been there for so long, they are easy to overlook, despite the activity on the tracks. But just take a look at Norfolk Southern Corporation’s Virginia fact sheet or view the video. The company’s contribution to our community, our state and our country is undeniable. And maintenance activities are entertaining as well. For more information, visit Norfolk Southern Corporation’s website at www.NSCorp.com. Read about Spring 2018 in South Norfolk.